Notes: The St. Cecilia Chamber Choir, conducted by Linda Blanchard and accompanied by Sean Fleming, will present its annual Lessons and Carols Christmas concerts on December 9th at 7:30 PM, at the Second Congregational Church in Newcastle, and December 10th at 4:00 PM, at the Bowdoin College Chapel in Brunswick. Advance tickets or reservations are strongly encouraged for this popular event. Tickets are $20 for adults, free for students, and can be purchased at Sherman’s Maine Coast Book Shop & Cafe in Damariscotta, Gulf of Maine Books in Brunswick, Treats in Wiscasset, or online at www.ceciliachoir.org. For more information, please visit St. Cecilia’s website or call 207-380-2768. Featured at the concert will be “People Look East” by Francis, “Salvation is Created” by Chesnokov, “Gaude Virgo” by Josquin des Prez, “Joseph, lieber Joseph mein” by Praetorius, “Ding dong merrily on high” by Wood, “Sing We To This Merry Company” by Rutter, “Coventry Carol” and “The Holly And The Ivy” by Ola Gjeilo, “Sussex Carol” by Willcocks, “Wassail Song” by Vaughan Williams, and sing-along carols. 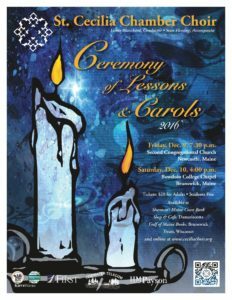 Hermione Blanchard Fleming, age eleven, of Damariscotta and Elizabeth Wallace, age ten, of Newcastle, will lead the candlelight processionals and sing “Silent Night” as a duet. This concert is sure to be a treat for the whole family! For more than twenty years, St. Cecilia Chamber Choir has been providing challenging musical opportunities and music scholarships for gifted local youth. This year, two Lincoln Academy students are members of the Choir and will sing in the Christmas concerts: Helen Newell and Maya Bailey, both of Newcastle. Since the Choir’s inception, over twenty-five gifted young students have sung with us, many continuing to study music in college and beyond.